President Clinton nominates Judge Richard Arnold to serve as Associate Justice of the Supreme Court « Hercules and the umpire. 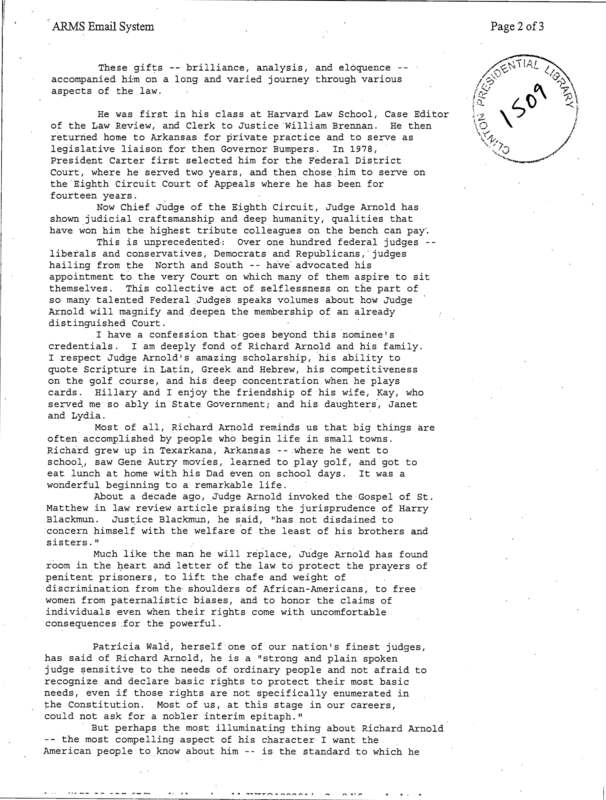 With many, many thanks to Elaine Mittleman who downloaded and shared with me a file pertaining to the late Judge Richard Arnold from an October 10, 2014 release of information by the Clinton Library, I am delighted to reproduce a draft of a speech prepared for President Clinton to use when nominating Richard to a seat on the Supreme Court. The time frame is May of 1994–the precise date of the e-mail appears to be May 13, 1994. 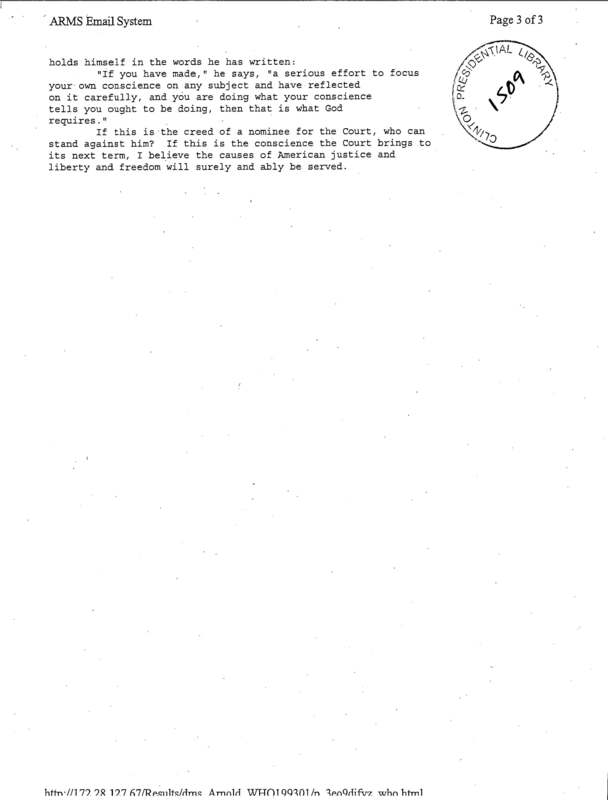 Of course, President Clinton did not nominate Judge Arnold on May 13, 1994 or at any other time. Richard had long suffered from lymphoma, and the President reluctantly decided that Richard’s health was too much of a gamble. Instead, President Clinton announced Stephen Breyer as Justice Blackmun’s replacement on May 13, 1994, with the United States Senate confirming Breyer on July 29, 1994. As I have said before, and with no disrespect to Justice Breyer, it is a tragedy that Judge Arnold never had the opportunity to sit on the Supreme Court. Our nation is worse off as a consequence. If you don’t believe me, please watch this video of the “The Art of Judging,” an address by Richard before the Eighth Circuit Judicial Conference, held on August 8, 2002 in Duluth, Minnesota. If nothing else, watch the first part of the video (starting at about two minutes) where Richard tells the story of his confirmation hearing as a district judge. As much as anything, that vignette tells you all you need to know about Richard and why other judges throughout the nation revered him. BRAVO!!! If you want to know why I am so savage in my criticism of our courts, it is because I agree with Judge Arnold. “Unpublished opinion” often translates to “this decision is unjust, but we like the outcome, and want to retain the freedom to change our minds.” As Judge Arnold put it, it is not a judicial decision, but mere fiat. Judges have a duty not to be cowards. That was the purpose of lifetime appointments. But they all too often are, and our clients are often the losers. Finally, for all his conceded excellence, he will always be remembered for Anastasoff. Why was he so wrong, and if he truly believed that judges should not be timid, why didn’t he dissent from the en banc opinion withdrawing it? Right doesn’t become wrong because you find yourself outvoted. That a case becomes moot has never been grounds for the withdrawal of a decision before. Dislike disagreeing on so technical a point, but a non final decision which has become moot should be withdrawn. That is what moot means. To steal one of the better titles of a law review article, ripeness and mootness, the postman always rings twice. Anyway original opinion still has persuasive power since it was never pulled from the reporter and whole issue is now truly moot because of FRAP. Frankfurter used to refer to Mr Justice Per Curiam. However he does not draw a salary. Lord Coke has a lot to answer for and most especially law reports. I have said it multiple times on this blog: our nation will remain great as long as it continues to produce public individuals such as Judge Arnold. 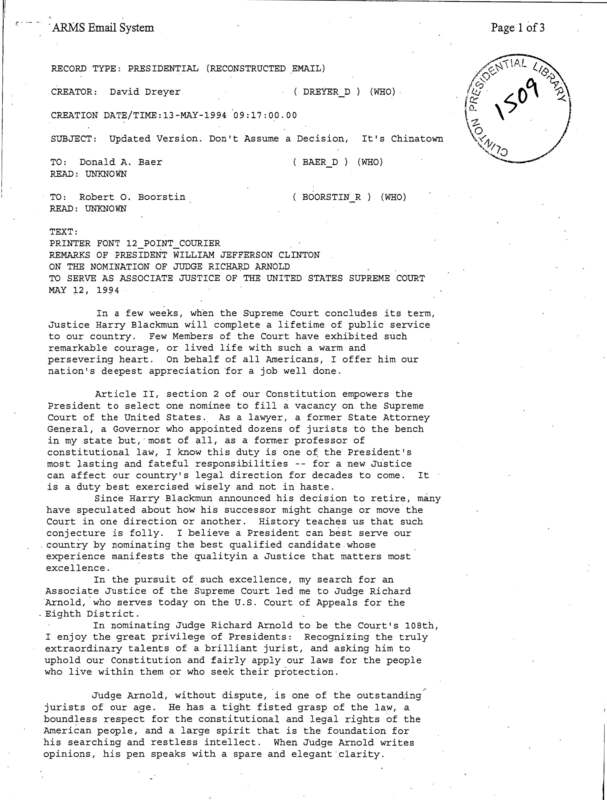 The file from the Clinton Library has two emails with the remarks of President Clinton on the nomination of Judge Arnold to the Supreme Court. The first email is dated May 12, 1994, and the time is 19.19:00.00. The subject line is – Okay, forget about Judge “B” — what about Judge “A”? I believe that Judge “B” was a reference to Interior Secretary Bruce Babbitt, who had also been considered for the nomination. Judge Arnold lived more than ten years after President Clinton decided not to nominate him to the Supreme Court. In fact, he died on September 23, 2004 – just about ten years ago. I think that Judge Arnold continued to have a very active career for those ten years after he was not nominated. I found a case, Bainbridge v. Loffredo Gardens, Inc., 378 F.3d 756 (8th Cir. 2004), which was decided on August 4, 2004, and in which Judge Arnold wrote a dissent. Rehearing was denied on September 10, 2004. As to Judge Arnold’s longevity, I think that his ability to serve on the Supreme Court for 10 years would have been a great opportunity for him and a great service to the country. It is a mark of his character and dignity that he handled the disappointment of not being nominated to the Supreme Court with such class. If the parties settle while a petition for cert is pending, is the binding published precedent of the Circuit withdrawn? I can’t recall that EVER happening. Do you have any specific citations? Anastasoff must have spawned 100 law review articles, and none thought the practice was sound. No court has ever agreed with Judge Arnold. He couldn’t find even a single precedent on-point in the withdrawal (which I reviewed, just to make sure I wasn’t crazy). The Ninth Circuit case was decided by Judge Kozinski — you can’t tell me that THAT one was randomly assigned! — and the Tenth (which was the first to question the practice) actually held that a victim of the practice had no standing to complain!!! Smith v. 10CA, 484 F.3d 1287. Courts of appeal have been notorious in their dishonesty on this point. Victims of our the practice have a right to be angry. As Judge Arnold said in the original opinion, the courts have a duty to do better. What I find troublesome is that it actually matters. If federal judges were faithful in their interpretations of the Constitution, it wouldn’t matter who nominated them. But he confirmed my suspicion. In our system, a judge is just a lawyer who knew a Senator. Other countries pick their judges on merit. The judges who belong on the Court handled it with class. Roger Miner is another example. Most of the Justice who are on the Court are somewhere between mediocre and atrocious. Curmudgeon – I don’t know who you are. If you were implying that a judge such as Judge Arnold was selected just because he knew a senator, that is a wholly incorrect assumption. Judge Arnold and the other judges have excellent educations, experience and career achievements. Even if there is a disagreement with the results of a case, the federal bench cannot be properly criticized for having judges who are not qualified. In my many years of being an attorney, I have been constantly impressed with the thoughtfulness and dedication of judges in what is a most difficult responsibility. I clerked for the Eighth Circuit a long time ago. The first time I saw Judge Arnold on a sweltering September day when the court heard arguments in St. Paul, I thought I was seeing Atticus Finch walking down the street! Both judges from Arkansas wore linen and (for lack of a better term) southern lawyer hats. I was totally charmed. How is litigant injured in fact by non publication of an opinion? No factual injury no Article III standing. A very experienced judge I clerked for sat, by designation, on multiple occasions with Judge Richard Arnold, and was very impressed by him (and shared your disappointment Judge Arnold did not get to serve on the US Supreme Court). Having read some memos our chambers exchanged during those sittings, I can also vouch for Judge Arnold’s humor and cordialness, even on those occasions when the judges disagreed either on the proper result in a case or the rationale for reaching the result. So, if I am an insurance company, and I don’t like a precedent set in a particular Circuit, I can just petition for cert, settle for more than the other party even wants, and have the precedent I don’t like vacated? If I have 500 cases like it, it is worth it. I get a second, third, and even fourth bite at that apple? That makes no earthly sense. Judge Arnold couldn’t cite a single precedent on-point in the en banc opinion. If the law was clear, he could cite it and move on. That was why the withdrawal was so unusual, and why it was criticized harshly in academia. There was no precedent, and you can see why. I agree with Judge Arnold. Every decision should have precedential value and, if a decision departs from established precedent, a judge should have to justify the departure. It is hard to figure out what the facts are in Smith v. 10CA from the opinion (I suppose I could look, if anyone cared), but Kozinski’s arguments in Hart are laughable. If I used my name, it would mean nothing to you, Elaine. That is what HE intimated in the speech. I would stipulate that Arnold was one of the best of the best, but you won’t find that out until you can assay a judge’s track record. However, I won’t make that concession across the board. One judge that really raised my eyebrows was Marcia Smith Krieger. By her own admission, she was a poor student — in the bottom fourth! — at a third-tier law school, but her daddy was a judge. http://www.colorado.edu/law/content/marcia-krieger-79. No nepotism there…. I work under the assumption that Article III judges are competent, which is why I am so harsh in my condemnations. They know better, but they all shade the facts and law to get to what are obviously outcome-based conclusions. And if you disagree, then take it up with Judge Posner, who is one of the most qualified men never to be nominated for SCOTUS. You changed the standing issue to a situation in which equal protection is denied by have two inconsistent lines of case law hidden by one line being unpublished law, which is no answer to my question and was not involved in 10th Cir. Case. I am not one of Kozinski’s fans, but his technical abilities usually rate more than laughable. Hard to find a doctrine of precedent strong enough to read into Article III at time of adoption, and English practice on publication has always been inconsistent, so that unpublished but controlling Court of Appeals precedents were not uncommon. I am an agnostic on unpublished opinions. Did not mean to hide, its repentinglawyer firing back. Not Annonymous except by accident. Arnold was a very fine judge, Breyer is brilliant, a very rare quality which you confuse with being a smart lawyer, not the same thing. In 50 or so years I have yet to meet a brilliant lawyer or judge though I have meet a lot of dam good lawyers and very smart lawyers. I would make an exception for 9th Cir. Noonan, who I meet once, but I may have been over awed by his abilities as a historical theologian and Reformation scholar. Probably Richard and his brother Buzz. Thanks for the very nice memory. All the best. I have never known anyone who did not come to the same conclusion if they had the opportunity to work with Richard. Thanks for your recollection. Yes, it is a vivid memory. So startling to a Yank. Their suits were immaculate without a wrinkle in sight and their manners were impeccable. The other judge from Arkansas was Judge Henley. As I recall, he drove to arguments with his wife in the front seat and his law clerks in the back seat. It is a bit of a hike from Harrison, Arkansas to St. Paul. Didn’t Mrs. Clinton weigh in on the Arnold nomination? If Mrs. Clinton is elected, it will be more of the same with a co-presidency. I did a little research on this and in fact, it is central to the 10CA case. P filed a facial challenge to the constitutionality of a bar admission statute, which should have been heard under Feldman. The trial court ignored the Supreme Court, and the CA upheld it in an unpublished opinion. P filed a pendent action in state court, which should have provided standing, as there were two cases consolidated on appeal. If a judge can disregard “binding” precedent whenever he damn well feels like it, what is left of the law? If you don’t mind my “butting in,” if P had standing on the day the lawsuit was filed, he has standing throughout the case under Roe v. Wade. It is an exception that keeps a judge from deciding not to decide, under the presumption that standing goes away with mootness. What about Posner? Kozinski? I read Breyer’s Active Liberty, and came away with the conclusion that his mind was full of mush. If HRC promised to appoint judges of the caliber of Arnold (instead of clowns like Thomas, Alito, and Sotomayor), she can have my vote right now. You’re exactly right. The Tenth overturned Roe, at least on the standing issue. Or to be more accurate, it made ad hoc law for that situation and that situation alone. One day before you’ll get good and done. Pretending the process has sewn without a stitch or two is at best humble at aunties potluck with a new girlfriend. Speech wants it, but that won’t do it. There shall be no ovation, like peers applauding. Best time, past time, to show that no tourists sits on the bench is…? Very few do what you do. Waiting for other than perspective to sharpen structural change. Couldn’t possibly be on you? It might even be in bounds. I doubt anyone can take your typewriter away! Yield all the family and personal folly you want.